The Approved Hose Assemblies Scheme is the fluid power industry’s leading accreditation scheme for hose manufacture, distribution, sale, and fitting. This establishes Plant Hoses Ltd as a quality supplier of Hydraulic Hoses to their customer base. Since it was introduced in 1995, the British Fluid Power. 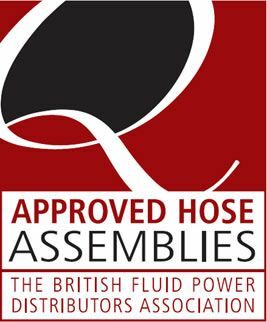 Distributor Association’s Approved Hose Assemblies Scheme has become a recognised symbol of quality, integrity, and safety. The scheme is open only to members of the British Fluid Power Distributors Association (BFPDA) and the British Fluid Power Association (BFPA). Gaining accreditation under the scheme is one of the key advantages of joining the associations and sets our members apart. The certified Approved Hose Assemblies Scheme sets an accredited industry-wide standard for the assembly, storage, and supply of hydraulic hoses. A panel of industry experts has developed it, including members of the BFPDA and BFPA. Members may achieve accreditation only after a detailed inspection process. Companies must be able to demonstrate that they adhere to all current legislation in respect of the supply, storage and handling of hoses which can be hydraulic or pneumatic. After approval, they are entitled to display the ‘Q-Approved’ logo on them premises and products. Scheme member companies also agree to a detailed technical audit by the BFPDA every two years. The Hose Scheme is an assurance that all hoses displaying the Q-Approved logo have been made and supplied to an approved standard by a fully-accredited manufacturing company or supplier, and comply fully with BS EN ISO 4413:2010 (hydraulic) and/or BS EN ISO 4414:2010 (pneumatic), and the BFPDA/D8 Quality Control Procedures guidance document. Have a professional understanding of hose technology? Agree to, and receive, a BFPA technical audit every two years.